After having typically appeared in the hallowed pages of Baseball Think Factory, Dan Szymborski’s ZiPS projections have now been released at FanGraphs for more than half a decade. The exercise continues this offseason. Below are the projections for the Texas Rangers. Perhaps the biggest disappointment in last year’s projections (and in 2018, really) was the several steps taken backward by Willie Calhoun. Originally, it was believed he would only be in the minors temporarily to beat up minor league pitchers while some service time shenanigans resolved themselves. Problem was, Calhoun never really earned a callup, struggling to hit Triple-A pitchers and only besting an .800 OPS in a single month of the season, a July that was driven by a .364 batting average. The Rangers brought him up when there was obvious playing time for him, but hitting .222/.269/.333 in 108 plate appearances was hardly a strong push for a full-time job. Even ignoring the cameo role in the majors, Calhoun’s power was mostly gone in the minors, which is not good. To be a decent starting left fielder in the majors, you have to be a batting average/on-base percentage deity or be a legitimate all-world talent on defense. Calhoun is neither. I wouldn’t write him off yet, but I’m very worried. I’m a little surprised that Texas either couldn’t or wouldn’t close a deal with another team for Shin-Soo Choo, a player whose presence required a losing Rangers team to carry a significant salary after Choo turned in a solid little year and had some trade value. Choo is quickly approaching age 40, and until Nomar Mazara actually turns his impressive raw power into actual counting numbers, Joey Gallo is the only really dependable Rangers hitter. Gallo is what he is, and will likely always have an abysmal batting average. He’s fortunate to not have been born 30 years earlier. One projection that intrigues me is Christian Lopes’, who was a third-tier prospect for the Blue Jays a very long time ago with a fairly mature approach at the plate coming out of high school. It never really manifested itself in the stats, however, and the knock was that he didn’t have a standout tool otherwise. But he’s made great strides the last couple years and has gotten to the point where he may be a pretty interesting role player, with Texas using him at a lot of positions in the minors. You can see the skinny rebuild in progress in the Rangers’ rotation. You have a number of OK-ish starters (excluding Yohander Mendez, who ZiPS hates with the fire of a thousand suns), probably none of whom will be part of the next good Rangers team. Drew Smyly, Edinson Volquez, and Shelby Miller are essentially reclamation projects, and at three years and $30 million, Lance Lynn may be the last of the quintet “out” of Texas (Mike Minor is there, too), but if the recovery in his peripherals in 2018 isn’t a fluke, Texas may get a real prospect for him. ZiPS is a believer in Jose Leclerc at the front of the bullpen, and sees the rest of the group as a fairly boring but quite adequate relief corps, which is fine with the Rangers not seriously contending yet. One of the most interesting Rangers projections is that of Brock Burke, a former Rays third-rounder who the Rays brought around very slowly out of high school. 2018 was the year in which everything clicked, with Burke seeing a 30% bump in his strikeout rate while also being promoted, striking out almost 12 batters a game for Montgomery. ZiPS doesn’t give him a huge ceiling, but is surprisingly confident in Burke being a mid-rotation starter despite only him only having limited playing time in Double-A. 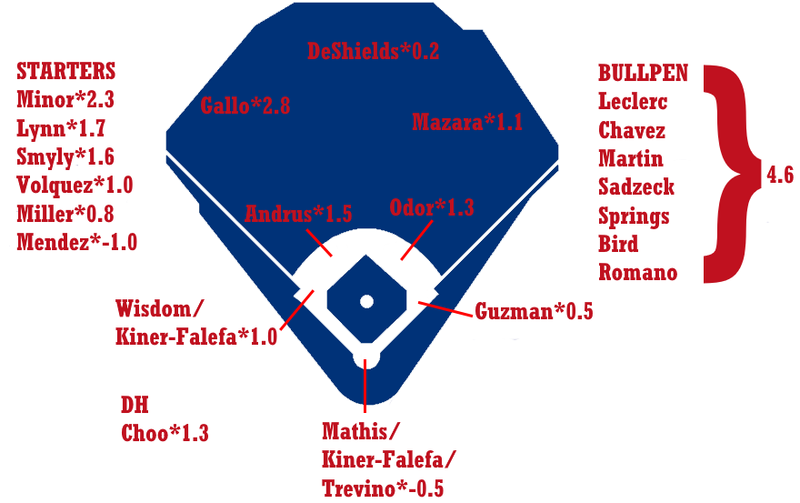 Andy Ibanez .249 .300 .376 75 .127 .282 3.9 1 0.2 Pete Rose Jr.
We hoped you liked reading 2019 ZiPS Projections – Texas Rangers by Dan Szymborski! Sunday Notes: Can the Astros’ Secret Sauce Spice Up Orioles’ Pitching? Be so disappointing if Nomar doesn’t improve by more than .1 WAR this year. He made a lot of improvements last year, and also regressed in some areas. But if the defense is bad instead of atrocious like it was in 18, the hr/fb rate can go with him elevating more balls, he could really be good still. He’ll be 24 all year. I still have high hopes, even if I maybe shouldn’t at this point. The thing is Mazara has never hit at the level that suggests above average major leaguer. His minor league numbers are OK, but he got tons of credit for being real young for every level. He’s never put the actual stats on the board. Cutch improved his contact percentage and became a star. JD and Bautista, well we know what they did. It is always possible for a player to improve, especially one under 30. Don’t stop believing!! You don’t give up on a hitter until he hits age 27. Mazara still has time. Judge him at 26 as he might bloom late.